30-inch 5.9 cu. ft. Free-Standing Dual Door Electric Convection Range in Stainless Steel Introducing the worlds first single and dual cooking electric range featuring second generation Flex Duo technology that offers the flexibility of two ovens in one. Big meals or small, full flexibility is now possible with a divider that turns this large cavity single oven into two ovens ready for a variety of occasions and demands. Its spacious 5.9 cu. ft. cavity and Dual Fan convection system provides consistent heat for cooking different dishes at the same time. The bright digital Twin Display touch control menu makes it quick and easy to control both ovens at a glance. The bridge burner provides more flexibility to your cooktop and enables cooking with oval shaped cookware and griddles. The warming drawer keeps cooked dishes at optimal temperature when served to your family. 30-inch 5.9 cu. ft. Free-Standing Dual Door Electric Convection Range in Stainless Steel is rated 4.2 out of 5 by 274. Rated 1 out of 5 by Fran from Not happy I’ve had this stove 21/2 years and the top oven doesn’t work. The top of the ranges scratches easily and looks horrible. I’m very unhappy with this. Would not recommend Samsung. Rated 2 out of 5 by Adea from Hot Indicator Light Stuck On I've own this range for just over a year, for the past 5-6 months I've been noticing the Hot Indicator light has been staying on longer and longer, even when the range is cool to the touch. Now the light stays on permanently and I cannot use the self clean feature as the display flashes "hot" everytime I try. Bought a Samsung Fridge along with this product and have issues with both appliances. I do really like how quickly the oven heats up and the flexibility of removing the divider. Just wish Samsung products were better quality. Rated 5 out of 5 by NEWAPPLIANCES from I absolutely love this range! From the warming drawer to the separated ovens, it is perfect! Look... I absolutely love this range! From the warming drawer to the separated ovens, it is perfect! Looks beautiful too! Rated 2 out of 5 by Mary from The hot surface light sensor needs replacing after 18 months! And they don't answer their telepho... The hot surface light sensor needs replacing after 18 months! And they don't answer their telephone at Samsung Canada ! Very poor customer service and not a very good product. Rated 5 out of 5 by connie from Perfect Range. 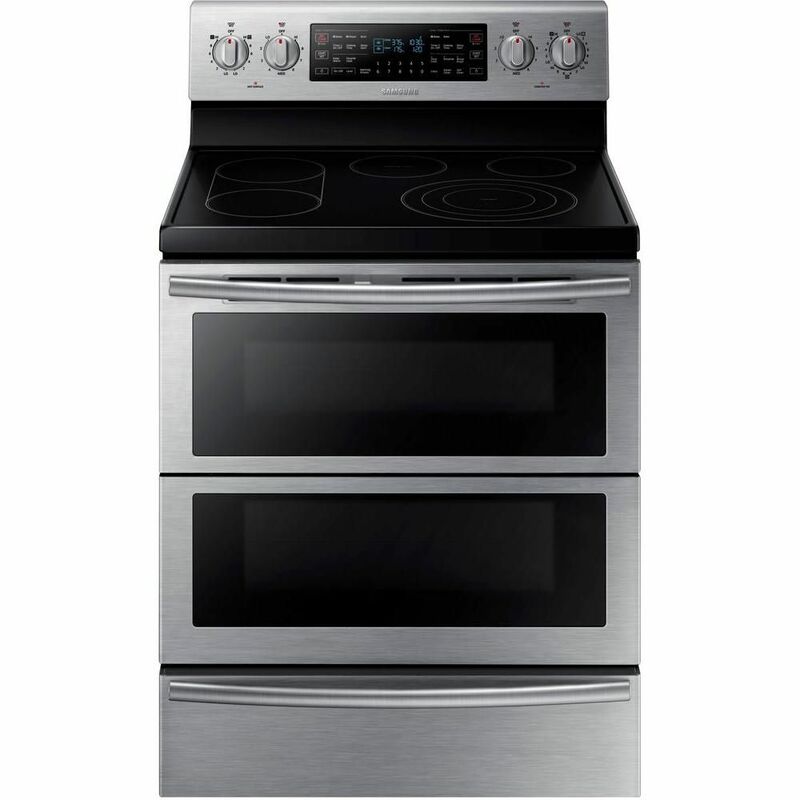 I had a two oven range before and loved the smaller oven and used it 80 percent of... Perfect Range. I had a two oven range before and loved the smaller oven and used it 80 percent of the time. The lower oven was hard to use the older I got. I'm short and leaning over the large door to access the lower oven when I cooked a turkey or ham was going to be hard. This range was my dream compromise. Two ovens that can convert to one. I love the oven shelf that tilts up when you only need clearance space in half the oven. I love the warming drawer that has multiple settings. A part I didn't notice until I got the range was two burners that will light up the space between them for griddles. I use this option often. The large front burner will accommodate a small, medium, or large pan/skillet. Finally, can use a small skillet on the front burner instead of reaching to the back. The color is beautiful. It cleans easy. I love the range. Rated 3 out of 5 by Agonza from Disappointing All my phones had been Samsung brand and I'd been very happy with them except for the battery life. Bought it in 2016 and the display was replace already one time and the glass top scratch easy and the smallest range it's not working properly when the heat get reduced.